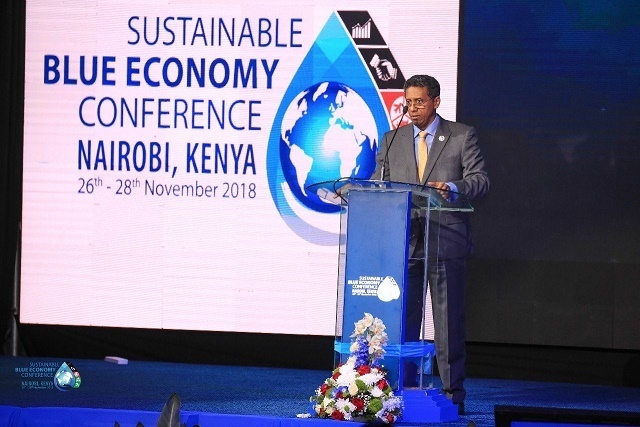 (Seychelles News Agency) - President Danny Faure highlighted the Seychelles' commitment to elevate the blue economy to the top of the global development agenda, especially in Africa, at the global conference in Kenya on the sustainable blue economy on Monday. “This Conference showcases the importance for the African continent to seize the rich opportunities that the blue economy offers us. We can confidently say today that Africa has firmly placed the blue economy on its development agenda,” added the President. Around 50 Seychellois in the blue economy sector are participating in this event which comprises government officials, the business sector, research institutions, and civil society. Seychelles, a group of 115 islands in the western Indian Ocean, is seen as a champion of the blue economy. In 2015, the island nation established a Blue Economy Research Institute in association with the University of Seychelles. Last month, Seychelles launched the world’s first sovereign blue bond, a financial instrument designed to support sustainable marine and fisheries projects. The blue bond is valued at $15 million over 10 years with guarantees from the World Bank and the Global Environment Facility. The island nation with an Exclusive Economic Zone of 1.4 million square kilometres relies heavily on fisheries which is the second top contributor to its economy. “As we sail towards a sustainable blue economy anchored in a healthy ocean, this Conference is a prime opportunity for all of us to gather our collective efforts and capitalise on the opportunities that exist within the Blue Economy in Africa and beyond – for the benefit of our people, and future generations,” said Faure. On the margins of the conference, Faure and the President of Kenya, Uhuru Kenyatta, held bilateral discussions at the Kenyatta International Convention Centre. The two leaders agreed to strengthen their countries partnership and collaborate further in the area of the Blue Economy.